The Christmas Market on the main square had its opening ceremony on 29th November but for Kraków people the Christmas season always starts with the Nativity Scene Contest organised by the Historical Museum of the City of Kraków on the first Thursday of December. This year on 4th December more than 200 people, adults and children, participated in the 72nd edition of the traditional contest. 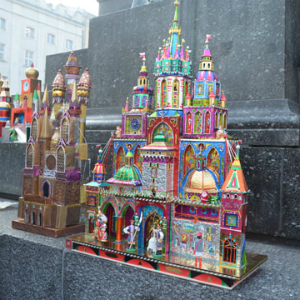 Before 10 am, amateurs and professional artists arrived to the Adam Mickiewicz monument in the market square with their nativity scene pieces to compete and show their hard work to the jury and Kraków citizens. Thousands of people, including several groups of children from kindergartens, walked around the monument to contemplate the works which were exhibited for a couple of hours that morning. Later, at noon the contestants marched with their artistic creations through the market square to the Pałac Krzysztofory, the Historical Museum of the City of Krakow (MHK). The building will host the nativity scenes in an exhibition from 7th December until 22nd February. Then, the winners will join the permanent exhibition that the museum have displayed for several years. Photo by Carmen González de León. Monika Kocbuch, promotional worker from the MHK, explained how the contest works: “There are four prizes: one for adults, another for children, another one for the biggest piece and the last one for the smallest. The winners will be announced officially on Sunday 7th December”. She also confirmed that the level is quite high: “Of course, there are amateurs, but also people very engaged and professionals who work for months on this project”. 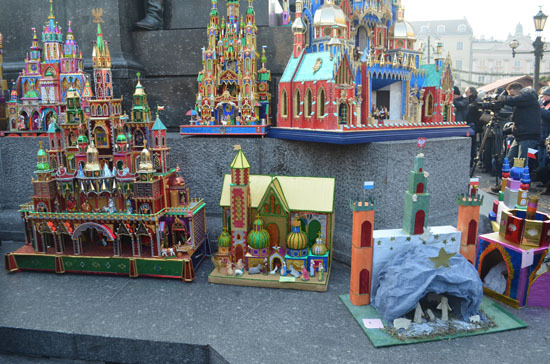 The works submitted for the first contests were simple structures made of cardboard or wood, but over the years, the nativity scenes represent a wide range of sizes, artistic media and materials. Nowadays they are often made of wooden slats, which makes them very solid, and they present the architecture of Kraków´s most popular monuments, such as St Mary´s Church, Wawel Cathedral or the Barbican. In fact, the majority of the works looks like small fantasy castles with patriotic symbols like the White Eagle and the Polish flag. Kraków Post TV came along on 4th December to see the Christmas atmosphere in the market square and check the level of the contestants. We invite you to see it yourself in the latest video from our Youtube Channel. And what happened to our lovely Krakow Post? On holidays for soooo long? ?